Which unit did you get? You got one as well ? Surprisingly to hear such a question here. Yeap the 2 bedroom duplex would be real nice. I got 1br one of the lower floor. Nice blog and see you neighbor. I do like this location a lot. Personally with this price point, it is a niche project. However new condo now starts almost at this price. It is unbelievable. Not too sure it is a right property for investment but I plan to live there and it makes me happy. Went to southbound Alaska cruise in July with Celebrity many years back, I enjoyed it. After disembarked in Vancouver for couple days, I flew into Alberta to Lake Louise. It was a good time. Thanks for your encouragement about cruise trip. check it. There are more renders of 185 and perspecitive of showroom (gonna be finished in July). If you have facebook, search my e-mail lin2tam@gmail or my name. We might be able to keep in touch. otherwise, hope to see you when project’s finished. Funny. I found that showunit renders and about to let you know. Definitely will keep in touch but I do not do facebook; prefer face to face. Will email you. May I join you guys? I just reserved 2 BD unit. 2BD wow… jealous. which unit krub? welcome, we should meet sometimes soon!! Excited to see this post by google. I booked 2B1 facing rbsc and 2J facing suanlum. Nice to meet all your guys here. It is worth for investment I believe so. @ Khun Noom – What floor are your units krub? @ Neighbors – We all should meet when the building finish krub. K. Tum-both 2B1 and 2J which I reserved are on the 12th floor krub. K. Verapong tam-Thanks for this blog krub. K. Tum-Why do you choose 2J krub? The developer has just decided to change some of 3 bedroom facing lumpini park and ban ratchadamri to 2 Bed room (2J) a few weeks ago. They said it is easier to sell. Are you the first customer who bought 2J facing Lumpini park? From what I know the first customer is the one who reserved the 9th floor. the rest are 3 bedroom so far. Did you go to the opening party of 185 last month at the Erawan hotel? – Yes. You are correct. I was the first person who reserve 2J unit on the 9th floor. I was very lucky that I contacted the sales office about 2-3 days after they changed the layout. – I do not want to be on the high floor because the master bedroom is facing SW. I want Bangkok Cable building to provide some shade for my bedroom (I am OK with a partial view of Chulalongkorn Univ. Hospital buildings). – I presume that you chose the 12th floor in order to be above Bangkok Cable building, right? Be careful for the afternoon sun na krub. – I agree with you that 2J is the best 2 BD unit in the building. More importantly, it is the only 2 BD unit with a full unobstructed view of Lumpini park. – I did not go to the opening party krub because I have been working in the US. K. Tum- Vow you chose the room unseen when you are in USA. That is amazing. 2J facing south west is an important issue and I did not realize before. quite high as it is an office building. So the 12th flloor of the cable building might be the same as 185 building. In worst case my unit is still at the same of the top of the building which is around the 13th floor of cable building. This is the decoration part like a cap of the building. I also visited the 9th fllor of bann ratchadamri. And I found that I can not see the pool of lumpini park on the 9th floor. So I decide to buy the highest possible floor as I could. The additional price for each floor between the 8th floor to 13th floor is 1,500 baht per sqm. But the different price between 13th flloor and 14th floor is 10,000 baht per sq.m. I like to buy for investment so I avoid the 13th floor. And the 14th flloor costs to high for me. So I chose the 12th floor. That is my calculation……. Hopefully it is correct. Wow nice to know all of you guys here krub. I have no idea that they just did another layout 2J facing Lumpini. How many sqm krub and the layout is similar to the lower floor of the 4B duplex? K oat – 2J Is 140 sq.m. Krub. I can Send The Floor plan by email krub. You could drop your email here. K Oat – It is 140 sq.m. at 30.3 Mil krub. I’m in Taiwan and surprise to see crowd here. Nice to know you all krub. I have no information to discuss with you guys now. But all units facing green is nice.. with awesome view. Hi all. This is totally my personal view (no pun intended) and observation on 185 being blocked by new projects as Baan Ratchadamri with our building. Eastside Rajadamri Wing – I bought 1A in a lower zone so I was trying to make sure that what is the chance of the new projects. Along this side is a 6 storey Lumpini Building, a house with buildings 1 and 2 storey. They are in Soi so the maximum height will be similar to further East Noble Ambience and Colony Lumpini Park which are 8 storey. Then further East will be more 1-2 storey houses until Langsuan. There is one plot where restaurant Khrua Nai Ban is however the newest project next to Khrua Nai Ban is Tropical Langsuan which is also 8 storey. Westside Rajadamri Wing – I do not think there will be any project that will block West, RBSC view. Only on the South side of 2B units with 26 storey Baan Ratchadamri and North side of 3B units with 20 storey Regent House. Eastside Lumpini Wing – I do not think there will be any project that will block South, Lumpini Park view. Only on the East side with 12 storey Parkview Mansion. However on the South East in front of Parkview Mansion, I have read but not confirmed that there will be new highrise project by Evolution Capital with Lord Foster’s design. Westside Lumpini Wing – I do not think there will be any project that will also block South, Lumpini Park view. Only on the South West side with 12 storey Bangkok Cable. I agree with Khun Oat’s point of view krub. However, I am not sure whether “Evolution in the Park” project is dead. If it will happen, it will definitely be a big competitor to 185. It will get South view of Lumpini Park and East view of Langsuan and Wittayu skyline. It will block Langsuan and Wittayu skyline of many units on the East side of 185 Lumpini wing. K Verapong – I think, for Raimon, 185 Rajadamri project must happen and succeed commercially as a proof of the new shareholder. They changed the layout of the Westside of Lumpini Wing on floor 8 – 16 from 193sqm 3C down to 140sqm 2J to increase more sellable units and leave the 53sqm on those floor as void area. This would also help Raimon’s image when they do official launch if they can sell as many units as possible during the pre-sale. Evolution in the park is located in Plot A right? What do you think about Plot C? I overlooked Lumpini view because of this crazy idea. This might too pessimestic or too far to concern.. but i raise this issue since i don’t like dense apartment with no view at all in Rachaprasong and Langsuan area. Yes Plot A – Evolution on the Park. Plot B – from North to South: Regent 7 storey, Lumpini Building 6 storey, a house with 1 and 2 storey buildings. Plot C – from West to East: UHM Building, several bars and restaurants. I hope there won’t be any project on Plot B! Plot C = 2 rows of townhouses (thickness of ~15 m max), then a narrow soi behind these townhouses (owned by 185). According the 185 team, there is not enough space for a high-rise buidling. Plot D = Baan Thanon Sarasin and Noble Ambiance Sarasin krub. They are quite new. Probably no change for the next dew decades. Part D = Red-roof house, Probike, and other house krub — like Khun Oat stated krub. I have read the belowed link in prakard.com. they mentioned that raimonland is a higher risk developer. I noted this was a post 1 year ago when they lost lehman as a financial backer. Now they got the solution. Anyone know more details about their solution. This is the only concern of mine to 185 Ratchadamri. Please appologize to my English. I can’t attend RAIMON annual meeting this year, otherwise I will ask this question about their solvency, D/E ratio too krub. However, IFA, biggest shareholder, increased their share in Raimon end of last year. And, they moved 185 project to Raimon PLC, (instead of subsidiary). I think this is a good signal. Let’s see their BS and cash flow of H1/10, since Raimon is going to recoginize revenue from Northpoint project. I’m not sure this cashflow is enough for financing 185 or not. otherwise, they might need to issue new share. anyone have further info. ? @K. Noom, may I have 2J plan krub? Many thnks for Sharing How to start analysis. To b honest i m Not in a Finance feild so really Dont hv any idea How To. 🙂 I did Send The 2j lay out To you yesterday by another email Address krub. Tonight When i m going back Home will Send Again krub. K. Noom, I got your e-mail krub. Thanks! I just read RAIMON’s minutes of meeting last year. Debt is a main issue for them now. Beside 185, Raimon still has 2 pending projects, Edge and Pleonchit area. I think they are too aggressive to acquire land bank and do not so well in inventory turnover. I hope Northpoint and River are going well in this year. In mid of May, we will do analysis of their Q1/10 performance..
K. Verapong Tam, You are welcome krub. I noticed that there is less investor in 185 ratchadamri and the river proect. Their dept and 40% down payment should be a main issue. I visited Northpoint at north pattaya. The quality is very impressive. They claimed that 85% has been sold. And customers start transfer the units. The river is such a hugh project, 2 towers with 72 floors and 42 floors. The building will be ready for transfer Q4/2011 or Q1/2012. I wait so long for this project. Now the building is growing fast. Have you ever visited the river show unit? Anyone know whether they got a lone from anybank for 185 ratchadamri project? I believe Raimon’s business model is different from Sansiri’s in terms of investors. It is really important that people who bought Northpoint do transfer the unit in order for Raimon to secure loan and proceed with their next project. Also both Northpoint and River are huge projects. Their Ploenchit project have not finalized but more affordable with targeted launch in early 2012. I guess we have to wait for 2Q10 result in Aug.
We have new 185 Rajadamri forum at Prakard.com already krub. Great! thnks for update krub. Update – Northpoint already transferred 62 units krub. I went to see The River show unit. It is real nice indeed. I think riverside condo has different feeling and ambience from CBD condo. 185 project already got financing from Bank of Ayudhya per contract agreement. Kkun Oat– Thanks for update kruv. I konw that the show unit of 185 will be ready after june. But for surroundiung where do u like more between the river and 185 ratchadamri krub? K Noom. I am not even sure on the timeline of the show unit because of the blockage on Ratchadamri road. I do hope that everything will be resolved soon, feel sorry for the country! Last week I went to have lunch with friends at Le Normandie and later for drinks by the river at Verandah the whole afternoon. I have to tell you that the Chao Phraya is so scenic and the view is ever-changing and relaxing. Time just flies. However commuting from the other side of the river through Sathorn is a nightmare and need to be avoided at all costs. Personally I always like Ruamrudee, Sarasin, Tonson, and Ratchadamri so for me 185 hands down krub. Thks khun Oat for update krub. Agree with khun Oat about River & 185.. View along chaopraya river at that spot is the best in thailand, in contrary; tranffic on Taksin bridge is the worst. I went to River once because 185’s sales claimed material of 185 is better than River.. I cannot imagine if this is the truth. Thnks all for keep in touch krub. K. VeraPong- 12,000,000,000 baht so many zero. But they got the load only 1.2 bil thb. It is only 1/10 of the total cost. Even we all have to pay 41.5% down payment. It is rick for us? Do you know how much Raimondland bought 185 land? Do you think the price they sell to us is reasonable? What do you think about Mahanakorn project? I went to see the show unit of saladaeng resident and mahanakorn they are using much better material than the river krub. I think 1.28 Billions Baht in the contract is just the value of land they put in (mortgage) with Ayudhaya Bank when they bought the land from Cambodian Embassy. Divided by 1762.9 sq.wah. = approx 726650 Bahts per sq.wah. I remembered that I have read some old news that 185 project will worth ~ 9.75 Billions Bahts. But this was the previous launch in 2008. Mahanakorn — Isn’t it a lease-hold project? Saladaeng — expensive, but blocked view. Sukhothai — the most comparable with 185. K. Tum – I also read from somewhere that raimoandland bought the 185 plot at 800,000 baht too. Sukhothai has a very good facilities. But locationwise is not convenient. Far from BTS, MTR and the traffic at south satorn is horrible. I have never visited sukhothai before. From their website it looks nice and oriental. Must have a look when they reopen the show unit for selling their last phrase. Sukhothai sold 70% of its units since launch in mid 07 and closed roughly one year afterward. They will start selling again when the project complete or near. The specification and amenities are absolute top, private elevator lobbies, large grounds, floating pool pavilion and hotel facilities/ restaurant/ spa/ gym/ pool privileges with price starting at Bht200,000 per sqm. I do hope that Raimon’s 185 will compete with Sukhothai in terms of quality. Mahanakorn is leasehold project started at Bht300,000 per sqm krub. Also very luxurious indeed. They offer special discount to 25 mil (from now until May, 30th or until) so only 190,000 baht/ sq.m krub. K Noom – thank you for correction na krub. I think the downside of 185 is that it is not connected to any hotel. So, the tenant will not have hotel service/facility/spa etc. on location. Khun Noom – How many years is the lease term of Ritz-Carlton Residence krub? Wow, they give 15% discount. Is it pre-launch sale? Everyone – What you do think of the Oriental Residence? K Tum- The Ritz Carlton is a 99 year lease hold project krub. The presale is in December after they built the show unit. The floor plan, material and every thing looks promising. But I do not like the lease hold project and love 185’s location more. They have just send an email to me last week offering the Limited promotion from now until May 31st, 2010. They are offering only 14 units at a very attractive selling price, (discount 15%) The availability is subject to “First come First Serve” basis. I have the unit lists and will send to you by E-mail krub. The Oriental residences isa 27 storey 5 star serviced apartment on wire less road. It is a 30 years lease hold project. The price is 145,000 baht/sq. m.(discount 10%= 130,000 baht / sq.m ) I have never visited their show unit krub. CBRE is the sole agent krub. Khun Verapong and K oat– I also send the RCR promotion to you via e-mail na krub. Thank you krub. 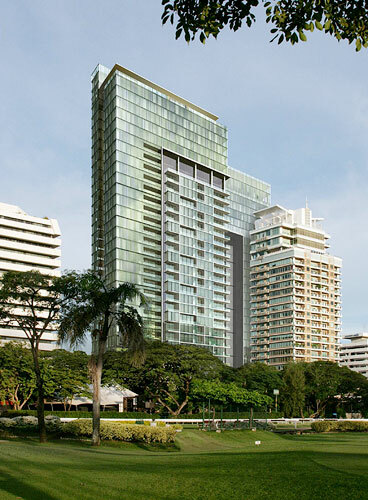 I read from somewhere that Sansiri will launch new project in Sukhumvit 39 later this year. What do you think of Prive? The project is almost finished but not sure that price has appreciated since launch in late 07. Prive, I do not know about this project krub. But I read from some where that it is over price. Project focus more for embassy staffs. I asked the same question on project comparison to Raimon. The company said the specification will be at the same level as those of Sukhothai Res, Mahanakorn, and St Regis. However as 185’s land is smaller (4 rais) and very expensive, there won’t be as many amenities. Those projects are under hotel’s brand and will feel more commercial. 185 is more like private residence. As 185 doesn’t have many amenities then the project will be made at the best quality. This is a good post in prakard.com. It is a post discussing about the luxury condo include 185 krub. I think from specification they will use ceramic tile floor in maid room only? I check with the general specifications and her is the details krub. that the living, dining, kitchen, bedroom; option; solid timber floor as per material sample or stone floor tiles as per material sample krub. The 1 BR ,70 sq.m at 185. The price is quite attractive but what your guys think about the privacy issue? As it is quite near to 2BR 2D krub. I think that’s why it is cheaper krub. I prefer the location of 1BR 61 but already sold out. For 2BR, the 2J is my favorite. What a clear answer! …. 5555 There are many good points to live in 185. I also can look over some small disadvantage. What do your guys think about the price appreciation of 185 in the next 3 years after the building is complete. K. Oat — So, did you decide to buy 2J krub? Yes, I bought 2 few units at 185 krub. One of them is 2J for investment purpose. As I plan to live at the river krub. I reserved the 1BR, 70 sq.m before but I finally change it too 2J krub. Still wondering is it a right decision for investment? 🙂 when I first visited 185, The 1BR (60 sq.m) was sold out. And 1BR (70 sq.m) seems moving slow. Most customer bought 2BR facing RBSC. As it is a 2BR with 30 mill. The river sales girl advised me that usually customer who pay 30 mill. they are expect 3 BR. 2J can only adjust to 2BR plus 1 study room. K tum- Sorry krub. I hv just noticed that you asked K. oat but I replied…. Thank you everybody for the comment and opinion krub, really enjoy reading it. For me it is more of a lifestyle driven purchase. I like the location and the amount of enjoyment can not be quantified. Only I wish I could upgrade and get the 2BR. The listed developer Raimon Land Plc aims to launch a luxury condominium project worth 9.7 billion baht in the second half of this year, says chief operating officer Kitti Tungsriwong. 185 Rajadamri is the company’s first project to be launched after two years of freezes. ”We had planned to launch the project in the second quarter, but we may not be able to do so because we can’t enter the project site to construct the show unit. Because of this obstruction, we will need to delay the launch for one or two months,” said Mr Kitti. The project will be located on a 4-rai plot on Rajadamri Road, a former site of the Cambodian Embassy, which has been blocked by red-shirt anti-government demonstrators for almost a month. The postponement will not affect Raimon’s revenue this year as the project was only expected to be 10% complete by the year-end, he said. The 240-unit development is scheduled for completion in 2013. Update – 185 Rajadamri has already been sold 47 units krub. this is an old post. Farangs were talking about the condo around langsuan area. I read and it is quite an encourage post. Hi all. You guys have any update on the project? I called my sales person asking her questions and update too many time already. 555 me too K. Oat . They told me that the big truck could not get into the site. So they can not continue building the show unit. Next time when I pass the site by BTS. I will took some photos and share with you guys. cashflowq1/10 is quite impressive from Northpoint project. when everything is back to normal, we should ask whether project date is postponed or not. thank you very much krub K. Verapong. We would therefore like to assure you that Raimon Land remains fully committed to develop the 185 Rajadamri project in accordance with the anticipated timeframe contained within the Sale & Purchase agreements. We would like to express our sincere thanks for having confidence in 185 Rajadamri and Raimon Land. As one of the leading real estate developers in Thailand, Raimon Land is committed to delivering quality products on time and in line with the highest international standards. Does anyone know when will be the launch day? New Sansiri is coming soon on Wireless road area. expected price 300k/sqm. Sansiri price is close to superlux condo now. (KEYNE = 160,000thb/sqm, PYNE = 140,000thb/sqm). However, it is not superlux unless you get prime location and put company image/product to that position. I think Sansiri try to do both and they got free PR and advertisement from this deal. Considering price range of new condos in 2010, I think 185 comparative price is undervalued now. From what I observed, Sansiri’s VIPs bought almost all of the units in KEYNE even before the official launch expecting to flip for quick profit but I think the resale at this kind of price will take time. The location is ok however a lot of supply in that area. Read on the net that Raimon Land sold the rest over 6 Rai of the Ploenchit plot to Noble Development already after selling 2 Rai to Thai Summit. What happen and what is going to happen to Raimon? Is IFA thinking about pulling out? This is absolutely a signal to reduce risk in Thailand for IFA, but I think it is too pessimistic if we consider this signal about pulling out. RAIMON now has to loan from IFA on 15% interested rate! this is so crazy… even higher than cost of equity. RAIMON has about 10bil in asset, 25% equity and 75% liability. P.S. I just visit Mahanakorn today.. very interesting project with attractive price..
FYI RL CRM responded that it’s a rumor. The Ploenchit project is still ongoing at the begining stage. I got same information from Noble. This deal has not been concluded yet. I visited site last weekend. So active… & took some pics to share. Thank you for these nice pictures! You have to go up to Regent House’s parking to get the similar view and feel of 185 Eastside, Rajadamri Wing. Thank you for every discussion here. I just bought 1 BD unit without any hesitation. 185 Rajadamri is by far the best super lux condominium in term of location and view in Bangkok CBD. Can’t wait to see the mock-up rooms. Nice to meet all you guys. @ Verapong: You think Raimon stock is a good turnaround play at this price with 2 projects in pipeline? I’m not sure about Pleonchit project na krub. If we take a look many condo projects in BKK, I would prefer be “(stock) owner” rather than “customer”.. This is not turnaround game krub. but speculative game. Raimon is at 0.61 now! actually, PS/SPALI/NOBLE also gained quite big gap now. I wish I just close my eyes and bought it. Raimon has not moved at all until over a month ago comparing to the strong performance of other property stocks. That was one of the reasons. Also we followed the company quite closely from updating the sale number and project status. It is speculative indeed since June 25, it has doubled whereas PS returned 32%, SPALI 52%, and NOBLE 30% during the same period. buy RAIMON stock is right for the wrong reason. Update: There will be 2 type of room in the 2-storey, under construction, showunit, 3-bed on the upper level and 1-bed on the lower level. They already sold 52 units even before the official launch, planned in September. Some of the big trees will be removed to the nursery, waiting to be re-planted back at the project when completed. Add: They try to open show unit and do official launch on 9/9/10 krub. Please explain Raimon Land’s business model. Raimon Land is a property real estate developer focused primarily on the luxury market segment in major urban and resort locations in Thailand. How are Raimon Land’s current projects progressing? We are in the process of delivering the Northpoint project in Pattaya. The 376-unit condominium is now 95% complete with 84% of the units sold, and thus far we have transferred 134 units to our clients. Now that the project is nearing completion, Northpoint is attracting new demand from buyers, particularly in Bangkok, where residents are looking for an upscale second home easily accessible on weekends. Wong Amat Beach, located only one hour from Bangkok by car and home to many new five-star beach resorts, including Centara and Pullman, perfectly fits this profile. The River project in Bangkok is on schedule, and completion is targeted for early 2012. Currently, construction has reached level 47, with 70% of the units sold. What are the company’s plans going forward in terms of new projects? Since 2003, Raimon Land has developed and delivered seven projects: four in Bangkok, two in Phuket and one in Pattaya, totaling 1,718 units or 6 billion baht sales value. We currently have two projects in development, namely The River and Northpoint, totaling 1,243 units or 19 billion baht in sales value. This means that in the next 24 months, we will have achieved three times more revenue than what we have achieved in the past six years. In addition, we have two more projects in the pipeline, which should generate another 12 billion baht in revenue from 2013 onward. Raimon Land has recently launched the Private Residence Clubs. Can you explain the concept? We entered into the Private Residence Clubs segment very recently for several reasons. Conceptually, the business of shared ownership in aviation, yachting and second homes is a sector that is going to experience tremendous growth over the next few years. Thailand fits the profile of a shared ownership destination. Despite the political uncertainty, it remains one of the most visited countries in Asia. Feeder markets are plentiful, the average length of stay is long, and seasonality is low. Our major shareholder, IFA Hotels & Resorts, already has successfully implemented Private Residence Clubs in Africa, Dubai, Portugal and so forth. Therefore, we do not have to reinvent the wheel, giving us the competitive advantage. What separates Raimon Land from the other property/condominium companies in Thailand? Most of our peers in the property development sector cover many different segments, from affordable housing to high-rise condominiums. Very few, if any, focus specifically on the luxury segment as Raimon Land does. Hence, the key difference between Raimon Land and our peers is our mindset. We think “luxury” throughout the development process from land acquisition to design, construction, delivery and so on. When selling luxury, one cannot cut corners. You need to use every space with a luxury mindset to meet your customers’ high expectations. Raimon Land’s financial performance has been extremely volatile for the past few years. Can you provide a reason for this, and what is the company’s outlook going forward? Raimon Land is still a relatively young company, with really only six years behind it. Earnings have been volatile because we had not yet reached a stable level of operations whereby the company delivers projects regularly. Over the past 24 months, we have worked very hard in creating this process so that Raimon Land delivers regular earnings. Once this is achieved, then we can talk about Raimon Land as a yield investment. Hopefully within the next few months we can demonstrate this. What do you feel are the biggest risks facing your business today? Real estate development in Thailand is currently an exceptionally healthy sector. There is nevertheless a risk that land and construction costs escalate too rapidly, in particular in Bangkok. As a result, developers could either be forced to push prices to unprecedented levels or reduce quality. At some point, we could reach a ceiling whereby domestic demand will stall. That is why Raimon Land is very selective when choosing sites for new projects. Furthermore, we regularly introduce new technologies to keep our projects at world standards while remaining competitive. Where do you see Raimon Land five years from now? Going forward, our core business will remain luxury residential development. However, we will also further diversify our sources of income with the provision of luxury services such as Private Residence Clubs and, to a certain extent, asset management. In terms of geographic spread, Thailand will remain our core market. Any update on the project krub? visiting the site, I think show units are on a long way to go krub. I guess end of Sep or Oct for grand opening. Rachadamri, Langsuan, and Wireless road have a bit excess supply situation. New supplies from Q-Langsuan, Prive, Hansar, The Rajdamri, Oriental, etc. in last 2-3 years could not have been absorbed with this kind of economic and political situation. then, sales of 185 might go slow for a while. buy 185 property is right for the right reason (i hope). anyhow, i wish i bought RAIMON more than 100 stocks too. 555 I like it and could not agree more! Anyone has update on the show unit construction krub? 1. Operating cash flow.. is getting much better with +579Mil compare to -36mil yoy as we expected from Northpoint. 2. Profit and Loss, -232mil compare to -225mil in Q2/52 because RAIMON recognized expected loss from selling Pleochit plot (to Noble) -250mil in Jul10. If we neglected this item, RAIMON could have positive P/L in this quarter. 3. I guess RAIMON HAD TO sell Pleochit plot in order to secure loan from AY bank. Future cash flow looks nicer to pour on 3 yrs of 185 project. Really cool map website. better than google maps, i think. I passed show unit about midnight and saw workers were still working there!!!!!! If no change, Sep 22nd is the launch date krub. Owners will be invited to choose the material and color etc. I visited the Met Last week. My expectation of this project was quite high but it made me a big disappointment. – Floor to ceiling is not real 3metres. – Facilities look not good as 3D rendering. Anyhow, private life and exterior design of building are superb krub. Regarding to invitation card of 185’s openning date… this wording kicked my eyes..
but it even makes our expectation higher. let’s see it soon. The by-hand invitation looks very nice in dark brown and grey. Could you guys please update me about everything that has happened at the launch today? I am not able to attend it. I am very curious to know any updates, especially material spec, current price per sq.m., sales promotion, and the recent change of floor plan (?less duplex, ?more 2A and 2B facing RBSC, ?more 2J facing Lumpini Park, etc…). Hi all. For me I am a bit disappointed. They had a chance to make the show units really nice but blew it. Hubert should have gone to see Mahanakhon. Pace&Ritz-Carlton raised the quality bar to another level, so meticulous compare to very cheap looking decoration of 185. They need to redo all the interiors. The units look just like the River’s with minor detail upgrade. They use oven, microwave, and cooktops by Gaggenau, washer&dryer and fridge by Siemens. There are 3 colors of stone floor tiles and teak timber floor to choose at no extra cost. Not sure about cabinet, will have to go back. They changed the floor plans and added more rooms, more 1A and 2E on 9th floor, more 2J from 8th – 25th floor, and 2B duplex on 20th, 22nd, 24th floor are now 2A and 2B similar to 19th floor. I want to know about kitchen cabinet brand, is it imported brand or not? Do you have more info on this matter? K Verapong, great mind thinks alike! Now, I don’t think 185 can sold out with only selling point of “Location”. I know many friends who changed their mind to other projects when they saw show unit and got uncleared information of 185. Update – More new rooms are released for sale today. The price also has increased around 5 – 10% from presale depending on the units. @ Khun Oat — Any news on 1C, 2K, and 2L krub. I heard that 1C will be 78 sq.m. What about 2K and 2L. K Tum. No official information on 1C, 2K, and 2L yet. If 1C were to be 78sqm then 2K and 2L will be left with ~100sqm each krub. Well not quite, 2C+3C = 155+193 = 348. If 1C = 78, so 2K+2L = 270. Not sure how they will divide them. What do you think the view of 2L unit (SE corner)? I am not sure how big (wide) is Parkview Mansion building. Will 2L see Langsuan/Witthayu skyline? They revised 2C – 155sqm and 2D – 125sqm to 1C, 2K, and 2L and keep the corner 3C – 193sqm. 2L corner would have North view into Regent House Bldg and East view of Langsuan/Wireless skyline. Parkview should be along East view of 3C krub. 2K and 2L will be 102 sq.m. each krub. 1C will be 78 sq.m. krub. Too bad, I was hoping that they will change 3C (at Southeast corner) facing Lumpini Park to be smaller and more affordable. After all changes, 2J is the best and most affordable unit with Lumpini Park view. @K. Tum : thank you krub, Any idea for price per sq of the new unit krub ? Anyone consider units per floor of fl 8th-13rd ? shall we ? I got floor plan and price for new unit. It’s available for sales now. Khun Verapong — Could you upload the floor plan krub? Just curious to see how they divide them up. K Verapong. How was Raimon Q3 performance krub? I just forgot to check Q3 FS. Honestly, I have no comment from such a mediocre FS. Obviously, Raimon gets a bit better from struggling in debt. Cash flow looks positive from selling Pleonchit plot and down payment of new project. I think Raimon has enough cash flow and existing credit line(4bil) to develop 185. (and new project, Zine Wongamart), even sales does not go as good as company expected. Nothing has to be worried krub.. (From Raimon’s developing pipeline, Raimon will put more focus on 185 and Zine in 2011) Management claimed in public that they will not aggressive as they did in few years ago. AUA is going to change,but not finalize yet. Thank you krub khun Oat. Piling is completed now. Main contractor will be released soon krub. There are 3 participants in final auction for selecting main contractor krub. It should be finalized within early-mid of March. I think Raimon has awarded the contract already only waiting for official announcement. Construction will commence very soon. Arggg Raimon stock is over 1.10 Baht today. It was 0.31 Baht when I signed the contract, should have bought its stock instead! Just got back from NYC krub. I’m glad to know that Bouygues Thai is main contractor for this project. Their construction site on The River project is quite impressive. Update – Raimon has increased the price again by another 3-5% once the construction commenced. Now with new 80-storey Areeya project on AUA site, not sure that the Northeast view will be blocked. So Raimon sent the material selection letter to the owners and we have until the end of October to choose floor, bathroom unit, wardrobe, and kitchen cabinet finish. Wondering what will you pick? I’m going to get my choice next week krub. For AUA project, I hope crown property will control design and concept of Areeya.. I just visited Noble Plearnchit… I feel Noble does a good job to fit their customers with this project. 6-9Mil/unit with high price per sqm and super small room and NO view.. it already makes new standard of condominium price (in Grade B+ segment)… no wonder to see new list price of 185. Plearnchit add another piece of this area…. In next few years, we will see boom of lower area of Langsuan road and Wireless road.. Does anyone have updates on the project sales and construction? Update – now Raimon sold almost 50% of units with recent transactions came from roadshow in Hong Kong and Singapore. All 1-bedroom 1A type are already sold out with only couple units of type 1C left. sales are really bad, HK nothing sold. So now they are stuck with 60% of the project at too high prices. Rumour has it that they are seriously running out of cash now and desperately trying to find a buyer to buy the company.Thee are no other sources of funding available , they are leveraged to the ceiling check out their debt to equity. The majior s/holder has also run out of cash in Dubai. Google IFA or check out skyscrapercity for more of the bad news. Serious stuff. Not able to complete projects and nor even picking up phones. Also and this is the killer – they have almost no c/f coming in for over 2 years ! i mean litreally zero. and when it does come in its way less than their debts, and it will all have to go to the banks. All the projects are projected to lose money as they cant sell out the last 20-40% of any projects. River Northpoint and now 185. ! This company is technically bankrupt, and this is why so many potential buyers have been scared off. Rightly so. thks for your comment. but you’re late Jerome. we discussed about cash flow of Raimon a year ago. I would agree with above comment if you posted it last year. pls note that d/e ratio now is the effect of new IFRS standard. I don’t think we have to worry about this point at the mement since The River is going to be transfered soon. I also found good point that project has not sold out yet. If we have 40-50% (not sold units) as hostage to guarantee the project’s quality. this is the same idea of investment, I like company that owner hold a significant shares of company. Does anyone have more update on construction and sales krub? Any price adjustment? It’s rising about one floor per week. now it reaches 7th floor. Lobby height is quite impressive krub. ห้อง 2B หน้ากว้างด้าน RBSC แค่นิดหน่อยเลยไม่รู้ว่าจะดีมั้ย? Think of buying resale unit of 185 Rajdamri for 1BR 70sqm on 10+ floor, the owner willing to sell around 177k persqm….is this interesting krub? Not expensive krub. Make sure that you don’t mind if it is floor 13, floor 10-12 might have a bit problem with opposite mobile antenna krub. I’m thinking of buying a resales floor 13 unit 2F. Just wondering if u guys think it’s a good idea? Or should I just go with one bedroom 70sqm on floor 12? Will the view be blocked in the future? 2F is 2brs right ? I would go for another choice of 2brs since it is blocked by Regent house bldg. 1br is safe from any bldg. what would be price range for resales unit though ? After all I willl bee subscribing to your rss feed and I am hoping you write once more very soon! Hi guys. I went for inspection last weekend. Have you inspected your room yet? Also should we co-owners have some page like “185 Community” to exchange information and increase negotiation power with the juristic? Khun Oat. How is your inspection going? Do you find everything in good order and meet your expectation? I ask 185 for a browse (I am not ready to inspect the room) but she says I have to inspect the room other I cannot see it. I think Raimon Land has to improve its atitude towards the clients. All the time I receive nonsense conditions from it. The common areas are not 100% finished, but they allow you to see them !! (but not the room). K Thirapong. The inspection went fine but plenty of minor fixes with one major issue – scratched glass window/door in bedroom and to balcony that need replacement. I felt Raimon knows that they can sell this project from location anyway so they do not really put much effort into finishing quality, common area included! The 50 Baht look plastic – made in China – door phone is inexcusable. Popcorn concrete wall in the lobby? You got to be kidding me. Also you can tell by the blah standard of the new show suites compared to attention-to-detail one like Saladaeng Residence. If show suites represent the project as it should have been, owners knew that they are screwed over by Raimon. Mark my word, 185 Juristic ghosted by Raimon had better be straight forward with integrity! I will be watching you very carefully. Not sure why Raimon does not tell every customer! What brand of hood did they install in your kitchen krub? I was expecting Gaggenau (like in the showroom) or at least Siemens. Mine is not either brand. The good is not branded krub, more like cheap Chinese one. – Are there many defects in your unit? – How soon did Raimonland fix them? – Did they do a good job fixing everything as you requested? – Did you wait until all defects were completely fixed before transfer? – Will Raimonland be similar to the other developer who ignore customer requests once the unit was transferred? Already transfer and have a lot of problem with them. Please be careful to check out your HI GROSS table, top, closet, etc. Please use your hand to feel every square inches of it, because when there is some fixing, instead of the brining it to repainted and spray in factory, they will just use white color to paint it there and it is not HI GROSS anymore. I am unlucky that I already transfer and find out it after move in. And they refuse to guarantee and fix it. Also please use ladder to watch out your Air con ceiling, they do not it is very ugly, they didnt close and finish it proper, so when you open air con, it will blow a lot of dust and color on to your room. If there is anything they can hide or can conceal, they might do it, so please inspect your room properly, and once you already inspect first time, when you check second time you have to re-check your room all over again, because their staffs could damage other part of your room (as what happen to mine). Lastly, “DO NOT” transfer your room before they 100% fixing your problem. No matter how they say that they have warranty. Because once you transfer they will say “YOU ALREADY INSPECTED AND THESE PROBLEM IS NOT IN THE LIST AND YOU ARE THE ONE WHO CAUSE IT YOURSELF” then they will run away from it. I have my room inspected in mid-April. I found some 60 defects, about 80% are minor. Serious ones, such as air cond in MBR not properly cool, water not drained in bathroom, etc. It took 185 about 5 weeks to correct them. I re-inspected the room again just on June 6. They have done quite good job, but still there are some 20 defects. I hope to be able to transfer the room very shortly, maybe in July. Strange, I do not know about the early transfer promo. I think you all have to see all defects corrected before transfer. – why they have to close the front (ugly) door at the Rajdamri rd. entrance. Not only that every car has to wait for the bulky door to slowly open, it blocks the good view of the lobby when look from the rd. I dont remember seeing other condos which close the front doors. – I expect the looby to be more elegant. The concept of “less is more” does not mean “cheap”. – Even when not transfer, Raimon land management should pay more attention to co-owner-to-be. I have made so several suggestions as early as the starting of the project (for example, there should be designated car cleaning areas, instead of each driver messing the parking with cleaning, etc. They (the management) have not given a damn to any of it. Agree with you that main door is very ugly. If situation in Bangkok is okay, they should change it…. also, they can’t sell remaining units fast if they won’t improve interior. Please be careful to check out your HI GROSS table, top, closet, etc. Please use your hand to feel every square inches of it, because when there is some fixing, instead of the brining it to repainted and spray in factory, they will just use white color to paint it there and it is not HI GROSS anymore (it will become rough not smooth and sleek any more). AGAIN use your hand to feel it, it can not see by eyes. I am unlucky that I already transfer and find out it after move in. And they refuse to guarantee and fix it. So finally I pay for professional HI GROSS to fix it by myself. Also please use ladder to watch out your Air con ceiling, they do not put it properly, it is very ugly, they didnt close and finish it proper, so when you open air con, it will blow a lot of dust and color on to your room. If there is anything they can hide or can conceal, they might do it, so please inspect your room properly, and once you already inspect first time, when you check second time you have to re-check your room all over again, because their staffs could damage other part of your room (as what happen to mine). Lastly, “DO NOT” transfer your room before they 100% fix your problem. No matter how they say that they have warranty. Because once you transfer they will say “YOU ALREADY INSPECTED AND THESE PROBLEM IS NOT IN THE LIST AND YOU ARE THE ONE WHO CAUSE IT YOURSELF” then they will run away from it. This is such an interesting blog. Funny thing is i found this out after I decided to buy a 2B1 unit. But I’m not disappointed. I would have decided the same even after reading all the useful infos here. Main reason is because i love the Green view I get from the master bedroom and the living area. On top of that I get to enjoy superb view of Suan Lumpini both from my Second bedroom window and the master bath. This really is quite unexpected. I Transferred the unit from Raimon Land on the 3rd of June. I Inspected the unit 4 times before this. There were only some minor defects and it took a total of one month for them to correct the problems. After transfer i found a couple more problems in the unit (paint finish on a couple of doors, paint blemish on the ceiling and some walls). I requested these to be taken care of and the team had done it quite swiftly. No complaints at all. When i instanced my pendant light, total wattage exceeded the max the switch could hold. so i literally blew the fuse. I asked for help from engineer team and they were very professional and provided all necessary help. All problems were fixed promptly with no charge even at first i was told the warrantee would be invalid if i tempted with the lighting/electrical system. So I’m quite impressed and happy with the help i got. I even got some minor ceiling repairs and paint touch-up done (all problems caused by my decorator and electrician ><) as complimentary service. So guys be cautious when checking details in the unit during your inspections before transfer, but do not be too worried they won't take care of you. My experience tells me the teamwork here is very professional and they are also very accommodating and pleasant. One more thing, i personally think the lighting provided in the unit according to the original lighting design is not for my taste. TOO DARK!!! Old man can’t see things haha. I found that all units are installed with 40W Halogen bulbs in all the standard downlight. Its very energy consuming and provided very little brightness. Cosy but impractical. I’m intending to change all the bulbs to either LED or Energy Saving Fluorescent bulbs. I’m sure this will be alright cos the total wattage after the change will be lower than the original. *Warning for those wanting to continue using incandescent/ halogen but changing to higher wattage PEASE check max the electrical switches can hold. You don’t want to blow all the fuses!!! Also for people adding more lighting linking them to the provided switches, PLEASE check the specs! Great post! I’m a mover and I know that packing and organizing things before it actually gets moved is more than half the battle. I enjoyed your tips and think anyone moving can benefit!